Doctor Who and The Green Death | The Daily P.O.P. « How did Nick Fury get that eye patch? There are deaths occurring in the abandoned coal mines of Llanfairfach in South Wales where out of work miners are straining to get by. Enticed by Global Chemicals with a new standard of living, they have little choice but to accept an offer that will nonetheless poison their land. A lone crusader has created a society of drop out geniuses to not only strike back at Global Chemicals and demand a better way of living but think up new less-destructive ways to live. For once, the Doctor is the odd man out and only reluctantly launches into action after his companion Jo is in danger. 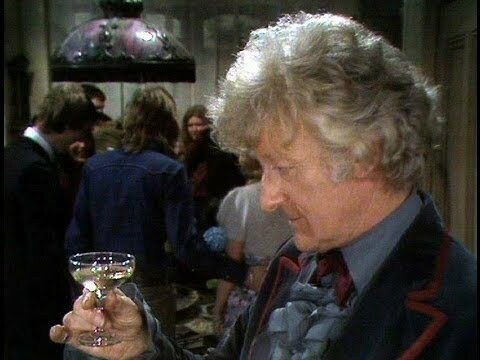 When I was first watching Doctor Who, the Pertwee era held no interest for me. Dated and far too action oriented with soldiers and make believe karate, it was far removed from the Gothic horror of the Baker era or the hard science of the 80’s. It took me many years to understand and accept the Pertwee era and learn the genius and novelty of what Barry Letts and Terrance Dicks had created. While his first year (a landmark golden series) is very much influenced by Quatermass, it is the three years that followed that saw a foray into fantasy and the kind of high adventure more commonly seen in comic strips. The Third Doctor was an anti-establishment character working hand-in-hand with the government out of necessity. Time and again, the Brigadier had to struggle to accept the Doctor’s holistic and more universal view and the Doctor in his turn met the immovable might of military bureaucracy. I had long misunderstood this era as the Doctor (a character I had long thought of as a pacifist) working with the military as going against everything the program stood for. But contrary to my misunderstanding, this era is all about finding a middle ground, about working amid differences. Given that producer Barry Letts was a follower of Buddhism and Terrance Docks was a conservative who seemed more interested in contemporary science, it is no wonder that this five year period was so inventive and full of importance. 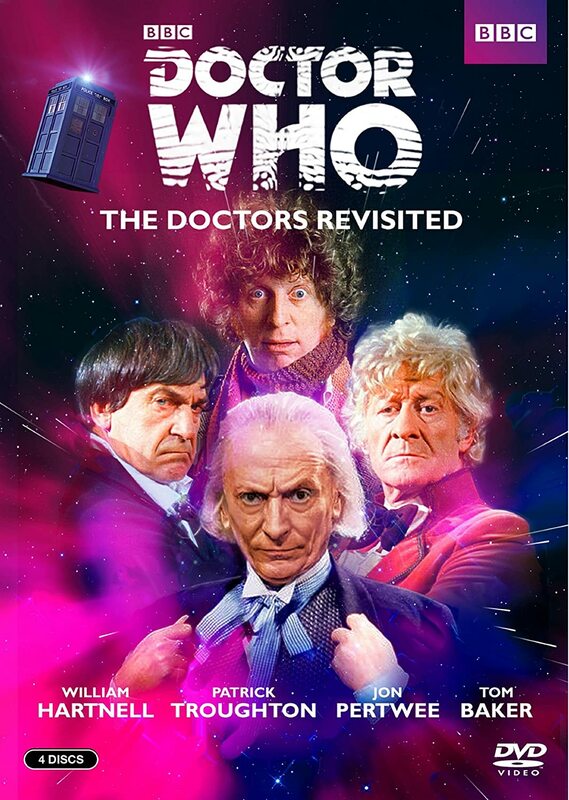 While the Tom Baker years are more commonly remembered as being the most popular time for Doctor Who, it was the Pertwee years that made it a household name. 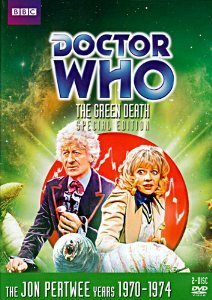 Green Death’s opening episode alone saw viewing figures over 11 million! 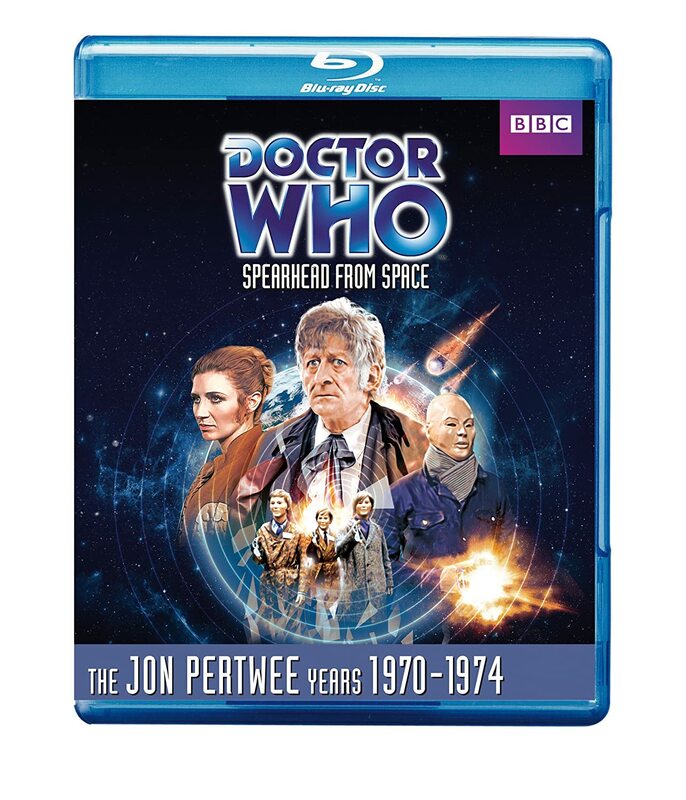 The mixture of the fantastic and the every day with Pertwee as the lead actor was a magical combination. It is clear in the Green Death that there is something more dangerous than simple radioactive waste causing the deaths. As the Doctor and the Brigadier attempt to free Jo from the mines, it becomes clear that some less traditional methods are called for. By collaborating on a bit of piracy, Professor Jones and the Doctor manage to find a way in, only to encounter the true horror of the impact that the waste is having, piloting a discarded railway car through tunnels of sludge filled with giant maggots. Meanwhile the Brigadier finds that he can do nothing against Global Chemicals even while the audience can see the villainous acts of the executive staff, seemingly under the control of the master computer called B.O.S.S. The United Nations, under pressure to find cheap alternative fuel sources are reluctant to look too deeply into how Global Chemicals operates, even as the monsters escape the mines and strike out at the countryside. Alongside the high drama and outlandish horror of the maggots and the evil computer, Professor Jones seems to have the answer, a slow path to progress using natural means. It is by no means a quick or easy solution as Global Chemicals (and in fact, the British Government) want, but it is a noble one. A far-reaching and bold move against the odds, the Doctor cannot help but be impressed by Jones’ fortitude. The Doctor once more plays the hero against the weird creepy monsters that made such an impact that it stuck with viewers for years as ‘the one with the maggots,’ but the deeper message was far more important. Our world is headed toward self-destruction and it may be that only forward thinking dreamers may hold the solutions. For all of its soap boxing on environmentalism and the dangers of big business dehumanizing the planet, this is a story about the end of an era… and it’s a pretty major one. The Doctor started his exile in Earth as a reluctant member of U.N.I.T. After the arrival of Jo Grant, he softened, growing quite fond of the human race and his place in it. 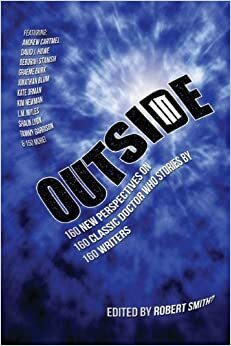 Moreover, despite her bravery, forthrightedness and resourcefulness, Jo Grant was a bumbling dingbat, constantly requiring the Doctor’s help in getting her out of trouble. This greatly fed the Doctor’s ego, making him every bit the wizard that he appeared to be. The Brigadier respected the Doctor, but Jo seemed to need him to cross a busy street. From the beginning, we see Dr Jones as an angry young man who is not complacent to stand and watch the world go down the tubes. A brilliant scientist and charismatic leader, Jones uses his scientific skills not to fight weird alien invaders but to make the world a better place. It’s no wonder that Jo is attracted to him and that a romance blossoms (she’d had several near-romances leading up to Green Death), but I refuse to view Jones as a replacement for the Doctor because it is not romance that causes Jo to leave the Doctor, it’s maturity. At the opening of The Green Death, the Doctor is engrossed with the prospect of traveling to Metebelis 3 where beauty and wonder await. Yet he fails to hear Jo’s equally string desire to visit the ‘Nut Hatch’ and join in Professor Jones’ movement. Frivolous adventure no longer appeals to her, she wants to make a contribution and that is the heart of this story. Maturity winning out over the juvenile joy of action and fantasy. By the close of the Green Death, the supporting cast of the Nut Hatch and U.N.I.T. have become so closely knit that they are having a small party celebrating their success. Jo has a real life ahead of herself and no longer needs to be protected by the Doctor. He serves no real purpose in her life now that the allure of his wizard-like personality has become familiar. But the real sadness is that the Doctor is forever the outsider. He cannot join in the party. No matter how much he has become comfortable among humanity… he is not human at all. He is a fantastic adventurer and cannot have a pedestrian life. It is his curse and his strength. In the following story, the Time Warrior, this is explored (briefly) as he reclaims his status as the man of action and magical solutions against a threat from the stars striking from the past. But the closing moments of The Green Death featuring the Doctor driving off into the early night alone are rather sobering and a harsh reminder that while he may be the eternal champion of the good and the just, he is also a wanderer in the space and time, and any companions that may accompany him on this journey are temporary, He is adrift in the cosmos, a solitary traveler and defender of the innocent, without a home. This Post was posted in Doctor Who- 3rd Doctor and tagged classic doctor who, doctor who pertwee, jon pertwee. Bookmark the permalink.